Have you ever noticed the difference in quality between photos taken indoors and out? The latter are higher quality because of the natural light. 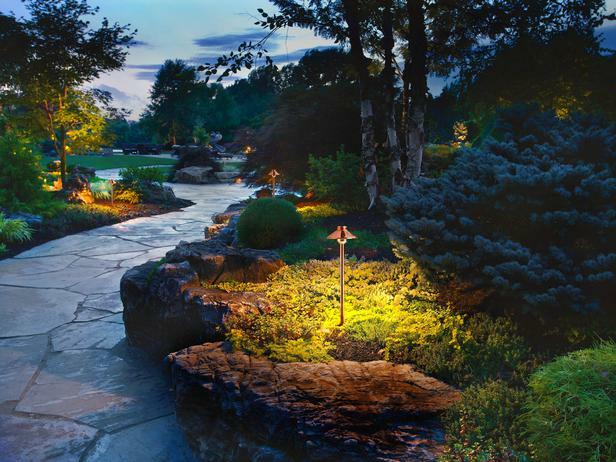 When lighting your landscape, a little goes a long way. Your eyes need less light outside in order to see light, shadow and pattern. The same is true night or day. This means that the best way to plan your outdoor lighting is to take a walk around your garden when it’s dark, envisioning whether you need more light to see in certain parts and assessing whether you can see the spaces you want to use. You might also want to rely on these tips. Certain principles regarding lighting apply whether it is day or night; for starters, that light has a certain colour and intensity. The colour of a light bulb will be listed on the packaging. The numbers range from 1800K, which is very red in tone, to 7500K, which is a bluish white. You can also pick based on function – overall, task or accent – which refers to how large an area the light will illuminate. There are a variety of bulb types which can be used in outdoor fixtures. Incandescent bulbs emit a pleasing light but have a short lifespan and high energy consumption level. Halogen bulbs are similar, but don’t share the same deficiencies as incandescents. Fluorescents are also available, and can be found in a wide variety of colours, are long lasting and consume a very small amount of energy. LEDs are perhaps best suited to an outdoor environment. Stocked by retailers such as BrightLightz, they have an extraordinarily long life and extremely low energy consumption. Although the most expensive option, there costs are continually declining. Solar lighting options exist too. Position and shielding are very important in outdoor landscape lighting in order to prevent glare. Glare occurs when the light source is too big or bright. It can be blinding when it reflects directly into people’s eyes. You should also be careful to avoid unwanted light pollution that shines into indoor rooms. This can be circumvented through careful positioning and the use of shield bulbs. Paths: A well-lit path is both welcoming and required, providing illumination that extends hospitality to visitors and makes walking more secure. High illumination isn’t necessary, and downlights are recommended to prevent glare. Individually lit pavers are a great, creative way to light a pathway, and create a magical effect. Entries: Placing lights to either side of the door or overhead the front, back and side entry doors not only allows you to see who you’re greeting, but clearly shows visitors the way to your door even in the dark. Driveway: Low-voltage landscape lighting is a good option to install on driveways, and is a great aid for parking in the dark. Steps: Steps should be lit for safety – but also because it creates a great effect. Illuminate either the risers or the treads. Decks or Patios: Why not use lighting to illuminate a specific task area, such as a cooking or seating space? Uplighting, which is quite tricky to accomplish, can also be used to send light upwards onto an umbrella or ceiling, where it is caught and creates a pretty extra-terrestrial effect. Gazebos, Pergolas or Trellises: Use lighting to highlight an interesting element in the landscape of your garden, drawing people’s gazes across to it. Architectural Features: If there is a stunning period statue in your garden or an attractive arch or clock tower, use landscape lighting to wash it. This beautifully accents the piece, and creates interesting highlights and shadows on the wall behind. Follow these tips to transform your garden into an outdoor gallery to showcase your stunningly landscaped lawns and flowerbeds.